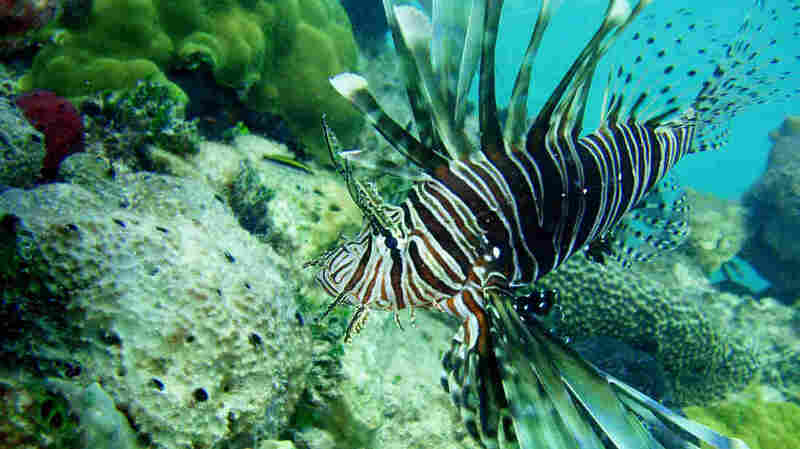 Lionfish Attacking Atlantic Ocean Like A Living Oil Spill Scientists say they have few weapons to wield against the poison-spined lionfish, which is gobbling up reef fish in the Bahamas and other habitats. A gluttonous predator is power-eating its way through reefs from New York to Venezuela. It's the lionfish. And although researchers are coming up with new ways to protect some reefs from the flamboyant maroon-striped fish, they have no hope of stopping its unparalleled invasion. Lad Akins has scuba dived in the vibrant reefs of the Bahamas for many years. But when he returned a couple years ago, he saw almost no fish smaller than his hand. "Seeing the lack of small reef fish that used to inhabit those sites was very startling to me," says Akins, the director of special projects at Reef Environmental Education Foundation, a conservation group for scuba divers. The lionfish are native to the coral reefs of the South Pacific and Indian Ocean. They were first spotted off Florida in 1985. But it wasn't until the past decade that large numbers were spotted in the Atlantic, Caribbean and Gulf of Mexico. The fish may have been transported by the aquarium trade. A recent study found that in just two years, reefs in the Bahamas lost on average 65 percent of their small prey fish. Larger fish, like red snapper and grouper, decreased by more than 40 percent. Researchers warn that similar devastation could be expected throughout the region. Why are lionfish such phenomenal invaders? They reproduce every few days and eat anything that fits into their mouths. And nothing eats them because they're covered with venomous spines. Akins now spends most of his time studying lionfish, organizing groups of volunteer divers to capture or kill them, and trying to come up with other ways to get rid of them. His group published a cookbook full of lionfish recipes and tries to encourage restaurants and the fishing industry to see them as food. This map, from the U.S. Geological Survey and NOAA, shows where lionfish populations have been between 1985 and 2013. Scientists hope that removing lionfish one by one may help preserve native fish populations in some reefs that are important for tourism, conservation or fishing. But it can't stop the lionfish's explosive foray into the Atlantic and the Gulf of Mexico. "We know that we cannot control them in the entire ocean," says James Morris, an ecologist with the National Oceanic and Atmospheric Administration. "It's just too big." Morris says invasive species are biological pollution. "It's like an oil spill that keeps reproducing and will keep reproducing forever," he says.